SavorWisconsin.com has launched a new, streamlined site that allows users to search by city, zip code and even radius for Wisconsin foods. SavorWisconsin.com features the most complete online directory of Wisconsin's food producers, farmers markets, and local food events. Just in time for the harvest season, SavorWisconsin.com has launched a new, streamlined site that allows users to search by city, zip code and even radius for Wisconsin foods. SavorWisconsin.com features the most complete online directory of Wisconsin's food producers, farmers markets, and local food events. Whether you are looking for strawberries, spinach, cheeses, meats, or honey, SavorWisconsin.com will have a bountiful array to select from. 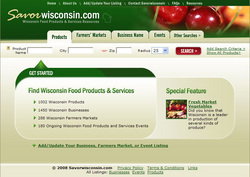 "SavorWisconsin.com is a valuable tool for both Wisconsin producers and consumers. Producers can market their products for free, and consumers can satisfy their local food needs in this one-stop-shop," said Secretary of Agriculture, Trade and Consumer Protection Rod Nilsestuen. Designed to respond to rising consumer demand for local foods, consumers can search for a variety of Wisconsin foods in a wide range of areas across the state. The website features over 1,000 Wisconsin products, over 200 farmers markets, and a host of special events. SavorWisconsin.com is managed by the Wisconsin Department of Agriculture, Trade and Consumer Protection, University of Wisconsin - Extension, and the Wisconsin Apple Growers Association. To use this resource or add your business to the listings, please visit http://www.savorwisconsin.com.